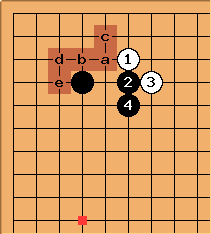 The tsuke-nobi (or attach-and-extend) joseki is formed by the moves to in this diagram. Its name comes from Black's plays in this diagram: is a tsuke (attachment), and a nobi (stretch). The tsuke-nobi has been intensively studied in Chapter 3 of the book Sizi Pu by Guo Bailing, in which 178 variations are shown. It is available in English under the title "Four-Stone Games." The tsuke-nobi itself is mostly popular among weaker players, but for stronger players it is still a good idea if Black wants to build thickness towards the left side, and does not mind giving White a position on the upper side. In other words, Black regards the left side as more important than the top. Often, but certainly not always, there will be a black stone around the marked point. After , White at a, b, c and d are all joseki. In pro games it is now rare unless justified by the context: either Black getting a very efficient formation relative to the left side, or White getting an overconcentrated formation at the top. Tenuki next for White isn't a good idea at all. If, for whatever reason, White allows Black to play the next move here, Black should not hesitate to play a. The resulting shape is very good. See also other possible joseki choices after .